I am not a quitter, I am a fighter. However, I had come to the place where what I was fighting for was draining me and was becoming unhealthy. So, I made a tough decision the other day, but it’s for the best and I am excited to share with you the journey I made that led me to the decision to turn in my 2-week notice at Starbucks. When Aaron & I were planning on moving to Alabama, the idea was that I would do my photography business full time. However, after living here for less than a month, and looking at our heavily depleted bank account, I decided to apply for a part-time job. Coming from Seattle, Starbucks was at the top of my list of potential places I could work, and I’ll be honest and say I was somewhat surprised when I got a call from one asking for an interview. This caught me off guard because working at Starbucks is such a big deal in Seattle, that it’s almost unheard of to even get an interview. Nonetheless, I went to my interview and was basically hired on the spot. A couple weeks later, I had my first day on the job. I loved working at Starbucks. My coworkers were nice and the perks were awesome! But then, I got offered a 2nd job at the elementary school nearby and I gladly accepted. Unfortunately, this caused some strife when it came to my Starbucks schedule as there were some days where I had been scheduled to work at the same time I was supposed to be with my 1st graders. I often found myself switching shifts with my coworkers, which was tough. This went on for a month before Aaron told me he thought I should quit and really spend time on my photography business. Stubborn, and secretly feeling as though photography wouldn’t work out, I stayed at Starbucks for a few more weeks before the topic resurfaced and Aaron again pleaded with me to quit. This time, I shared with him my fears of pursuing photography. It’s moments like these when I am awestruck with the deep love my husband has for me. After I shared my heart, he met it with honesty and encouragement. Photography is a tricky industry, no doubts there, but Aaron told me that I’m a far better photographer than I give myself credit for. And, by partnering with my inlaw’s DJ business – Live Productions – opportunities will be coming by the dozens in no time. Feeling more confident, I considered what life would be like if I took the leap of faith and quit Starbucks to pursue my dream full time. A couple days later, I had to work at Starbucks, and most of the time beforehand I was sitting on the couch praying asking God if I was supposed to quit or if I was supposed to stick it out. I asked God to give me some kind of confirmation (like I needed anymore, but still, I asked for it). I then went on my computer and visited a blog I read often – Peanut Butter Fingers. I decided to read a couple old posts of hers (My Decision to Quit My Full-Time Job & When Money Isn’t Worth It), and I found great encouragement there. Between those two posts, I felt like I had gotten my confirmation. I realized that it was okay to walk away, to follow my heart and pursue my career in photography. Sure, it’s a risk, and money might be tight for a little while longer, but I’m choosing to care about myself – to focus on a business that can do phenomenally well and can provide the lifestyle both Aaron & I want. At the end of the day, the “risk” is worth it. All that to say, I turned in my 2-week notice last Thursday. 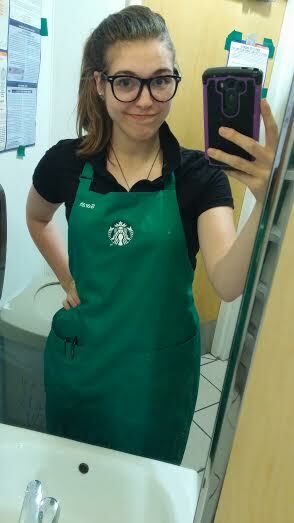 My last shift is coming up and even though it will be bittersweet, I’m excited for all that is ahead of me. I’ll miss my coworkers and the perks that came with the job, but I’ll be back to visit and at the end of the day, I know I did what was best for me!